I always do a post-conference reflection post to try to wrap up what I have learned and what I want to remember. For this post, I think I am going to have a little fun with the format instead of restating what I put in my previous posts… I’m going to call this my Best of #GSA125 list! The Best “New” Use of Technology I Saw — Although this technology isn’t “new,” this is the first time I saw GSA use the services of WebsEdge to broadcast videos and interviews from the conference at the conference and on conference hotel televisions. Although it was difficult to hear the audio when watching the videos on site, I can go to their conference YouTube channel and fill in the gaps. They even showed some pre-recorded videos from institutions such as my own, Penn State! The Best Car Magnets — OK, so there wasn’t much competition for this one. 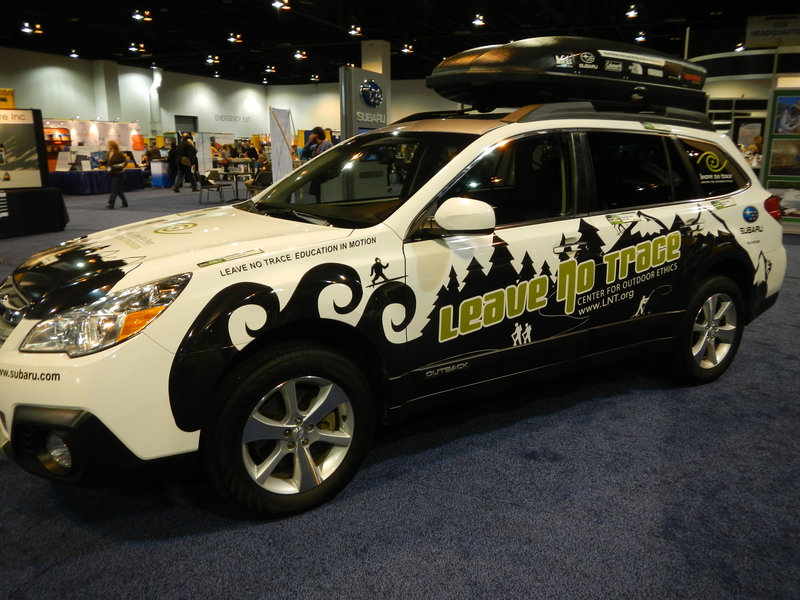 The Subaru/Leave No Trace booth clearly wins in this category. On the car, there were several magnets with the phrase “Test Your Knowledge.” The idea was for the reader to look at the item listed on the front of the magnet and to guess how long it takes for that item to decompose in nature. The answer was on the reverse side of the magnet. I took photos of three of the magnets and included them in this post to give you an idea of the activity. I really like this idea – it is interactive and educational. Unfortunately, I was told that these magnets were not available for purchase, but what a great idea for a student project to raise awareness about the environment! The Best “Toy” That I Must Have — The Exhibit Hall is filled with equipment for attendees to examine and try out for teaching and research purposes. I had heard of the Dino-Lite USB Portable Digital Microscope, but after seeing it zoom up on specimens, display on a computer screen, and to have the ability to annotate the images – WOW! Gone are the days of the microscope that just one student can look through at a time. With this device that plugs in to the USB slot on a computer, I can project the image to an entire class for discussion and analysis. Yes, there were bigger and fancier pieces of equipment on display, but just having a Dino-Lite will make me happy! The Best Music In The Exhibit Hall — OK, GSA is a scientific conference that is not about musical performances, yet there were performers on the opening night of the Exhibit Hall in the Subaru space. But my award goes to the African drummers that were in the booth for the 35th International Geological Congress Foundation during lunchtime (their next conference is being held in South Africa). Check out the video – I think you will agree! Thank you, Geological Society of America, for another great conference – can’t wait to head to Vancouver in 2014!